Further to their inaugural visit back in 2012, Trent College has elected to return to Desert Springs Resort. 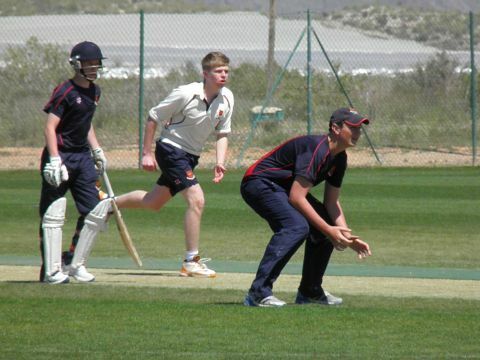 A cricket squad of Twenty (20) players aged between 16 – 18 years and Three (3) officials from Trent College will be stepping up their preparations for the 2016 season by completing a 4-day training camp at the Desert Springs Cricket Academy between Monday 4th – Friday 8th April 2016. The players and coaches will be spending their time completing a specific and carefully planned programme of numerous training sessions each day covering technical skills, bowling and batting o grass wickets, strength and conditioning and both individual and group activity. As they will be outside and on grass, the squad will also be able to do fielding and throwing practice. The players and coaches will be accommodated in some of the privately owned Apartments at Desert Springs and the resort’s executive chef will be on hand to cater for the special dietary requirements of individual players dining in El Torrente Restaurant. The feedback received from visiting groups can be viewed Here which has further confirmed the quality of the cricket training facilities and service provided at Desert Springs Resort.